The boys at Ingolstadt have unveiled the sedan version of the Audi RS6. The estate version had already been revealed earlier. Like the estate, the RS6 sedan is powered by a direct injected twin turbocharged 5.0 litre V10 with dry sump lubrication producing 580 horsepower between 6,250rpm to 6,700rpm and 650Nm of torque from 1,500rpm to 6,250rpm thanks to its turbochargers’ 1.6 bar of boost. The ridiculously wide torque curve ensures you experience the car’s peak torque of 650Nm over virtually every RPM point the engine could ever be in. Once the torque tapers down beyond the 6,250rpm point, you still experience all 580 peak horses all the way to the 6,700rpm redline. This is one truly breathtaking engine even on paper. Look after the jump for more details of the RS6 Sedan. 0 to 100km/h takes 4.5 seconds and it goes on to a limited top speed of 250km/h. The limiter can be lifted to set free an additional 30km/h of speed. Power is transmitted to all four wheels via the quattro permanent all-wheel drive system through a 6-speed Tiptronic gearbox with short ratios and manual shifting via the lever or paddle shifts. 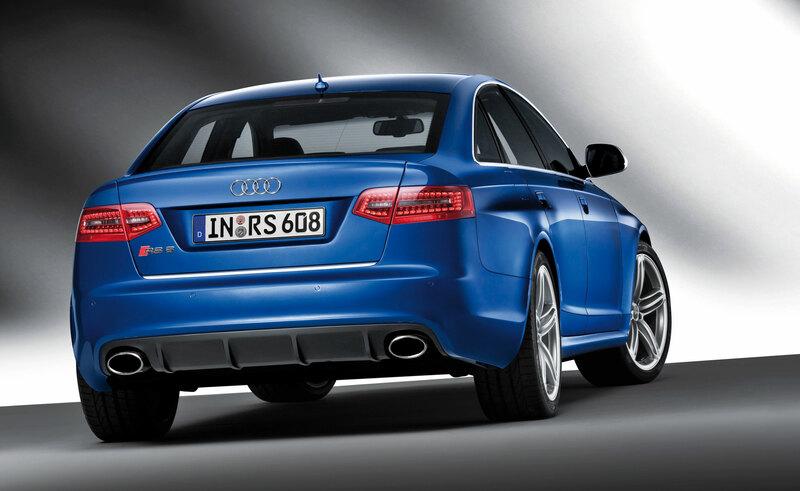 The Audi RS6 is fitted with Dynamic Ride Control, or DRC. 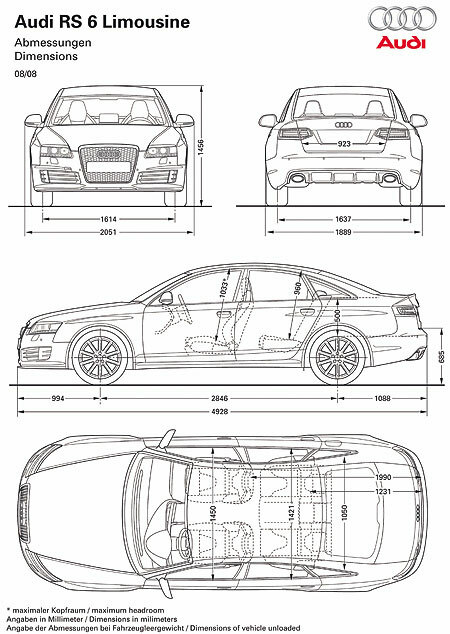 The RS6 is a large sedan after all, and DRC helps reduce pitch and roll using mechanical means. Opposing pairs of shocks are connected diagonally via hydraulic lines and valves. During a cornering maneuver, fluid flow to the damper being compressed by the outside front wheel increases, providing firmer support and reduced roll. The sport suspension plus option allows three different damper settings – sport, dynamic and comfort, controllable via the Audi MMI system. Brakes are 390mm steel discs at the front with 6-piston aluminium calipers and 365mm with single piston calipers. With the standard brakes, wheels are 19 inchers with 255/40R19 tyres. If you upgrade to the optional 20 inch wheels, you will then be able to fit a ceramic disc brake kit, featuring 420mm ceramic discs at the front with 8-piston caipers, and 356mm ceramic discs at the rear. The ceramic brake kit are lighter by 12.2kg. 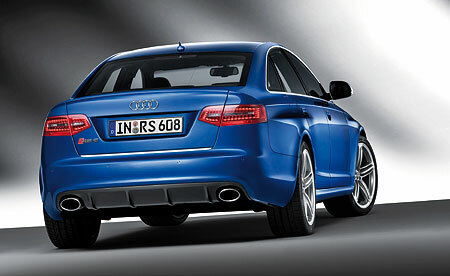 The RS6 was unveiled together with the facelifted A6 sedan, which also carries the RS6’s updated rear lamps. 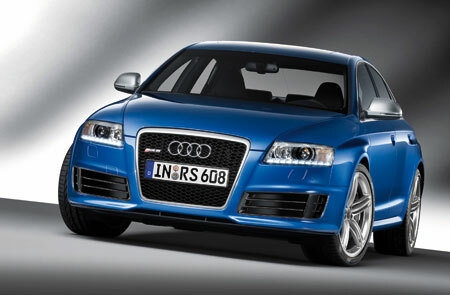 The Audi RS6 will be available in the market in mid-October 2008.